HomeBlog3D PrintingDeweycat: Is there a 3D printer in your future? I have been invited to write a few posts regarding 3D printing in the miniature wargaming world. While my experience is mostly within the 28mm WW2 genre (essentially Bolt Action but this is also applicable for Chain of Command and other similar games), the same concepts carry over into other scales and time periods. I come at this speaking strictly from my own experience and observation, both as a 3D designer and a model printer. Within the 3D printing community I am known as Deweycat. Examples of my design work are found both at my Thingiverse page here and most can be located on right here at https://www.wargaming3d.com/vendor/deweycatproductions. These are examples of 28mm 3D printed models of the French model Schneider 1913 105mm gun. It was used in early WW2 by the French, Finnish, and the Polish armies. Captured guns were then employed on the Atlantic Wall by the Germans. The file includes the wooden spoked wheels (forefront) and the pneumatic tired gun (in rear). Most miniature gamers are likely familiar with the concept of 3D printing; some of you may have ordered a print or two from Shapeways or a similar commercial 3D printing firm, or perhaps you have seen a club member’s 3D printed AFV or terrain piece. Being “of a certain age” I feel that 3D printing is currently much like home computers were back in the late 1980s – yes, I did warn you about my age – because back then few people had them in their homes, due to the cost, doubts about their real practicality, and people’s trepidation on how to use this new technology. I say this because just as we not can’t imagine a world without our digital devices now, I expect to see significant broadening of the use of and comfort with 3D home printing in the next few years. A 3D print of the British Lizard Armoured command Vehicle which was used by the BEF and in the Western Desert. It is listed in the new Bolt Action Western Desert book. The original .stl is available on the Wargaming3d.com shop. What I hope to do in the upcoming series of posts is to do a walk-through of the 3D hobby and how it can help the miniature wargamer. Perhaps you have toyed with the idea of buying a printer but are not sure where to start or you would like a model of a particular tank or field piece that just isn’t available from one of the major wargaming companies. My goal is to help and answer some of the questions you may have. What can home 3D printing do for my hobby? Does it make sense for me to get started into it? What do I need to get started? How much would I need to spend? How steep is the learning curve? What type of home printers are out there? What are some good objective sources of reviews on printers? What are some pitfalls of 3D printing? What are the limitations? What are the payoffs? Can I work out a cost / benefit analysis? Where do I find workable files to print? What would I need to design my own files? What are some tricks to know about the model lay out for the best possible print? What do I need to do post-print to finish the model? Is it a realistic home business opportunity? What are the licensing considerations for intellectual property? Are there any alternatives to obtaining quality 3D prints without purchasing your own printer? If so, what do I need to ask so I can be an informed consumer? a lightly armoured shallow draft gun boat with a turret mounted Maxim MMG and a rear mounted DSHK HMG. It can also carry a squad of eight men. this is available here at Wargaming 3D. I am coming from this as an enlightened amateur. I am not an engineer. I have no commercial interest or sponsorship. I am essentially a self-taught hobbyist printer and designer. I jumped into home 3D printing in January 2018, starting cold with no previous CAD or 3D printing experience. I did this partially out of curiosity and also because I like the more unusual AFVs – I get bored with the vanilla standard Tiger/Sherman/T-34 line ups. The offerings from the major retailers are growing but they are is still limited when you consider the great number of different models of Armoured Fighting Vehicles and other weaponry fielded in WW2. 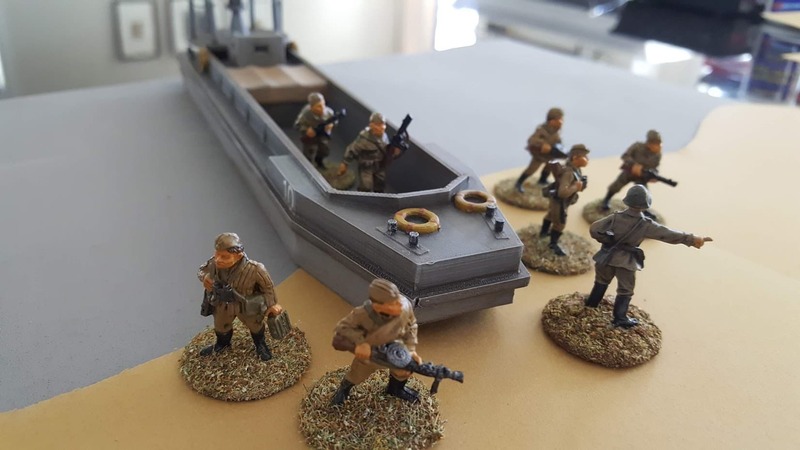 With the ever expanding range of 28mm gaming theatres – both pre and post 1939-1945 eras are opening up – having a wide range of options of what to bring to the table just helps keep your gaming more interesting. This is a 28mm scale horse drawn limber, available for download at this very site. You can’t get a more reliable gun tow than this – In Bolt Action a horse drawn limber will tow any sized gun onto the board, and it only costs 10 points when purchased as a regular. On top of that if it ever break down you will at least have some hearty stews at the mess tent. In this post I have tagged a few pictures of 3D printed models from files that I have designed. In this series I will show some examples of how files can be modified to improve print quality and even how to start designing your own files. While there is absolutely no need to design your own, and I doubt 10% of 3D printer owners do so, I will give you a quick tour of the process and an outline of the wide range of CAD programs out there. I invite you to contact me through this site or directly through a PM from my Facebook site. I thank you for your time and I hope I can help answer any questions you may have.